The Army Triathlon Inter-Unit and Individual Sprint Duathlon Championships 2018 will be held at Abingdon Station on Wed 25 Apr 18 commencing at 1200 hrs. DB Max Multisport events will co-ordinate the event. The race will be held on closed military roads and is a non-drafting event. Run 1 (Red Route). A flat 5km, two lap, run on tarmac. Cycle (Green Route). A flat 21.5km, seven lap, route on the runway and perimeter track. Competitors should make note of the route which will be displayed in transition. Static and mobile draft busters will enforce British Triathlon Foundation (BTF) drafting rules. Approved cycle helmets are mandatory. Run 2 (Red Route). The 2.5km, single lap, run on tarmac. Competitions. This event will host will host two key competitions including the Inter-Services Duathlon Championships, Army Triathlon Inter-Corps, Inter-Unit Corps and Individual Sprint Duathlon Championships with several race categories. a. Male Open Team. Twelve athletes with the first eight to count. b. Female Open Team. Six athletes with the first three to count. c. Male (Masters) Team. Six athletes with the first three to count. Each Team Manager is to confirm the team composition to the Events Manager on race day. Each service is entitled to enter any number of guests, which must be registered as such. Only those that count will receive a prize / trophy. a. Inter-Corps Male Open Team. b. Inter-Corps Female Open Team. Army Major / Minor Unit Team Competition. a. Major Unit Teams. Five athletes with the first four to count. b. Minor Unit Teams. Three athletes with all to count. Male Open Team. Champions (8) and Runners Up (8). Female Open Team. Champions (3) and Runners Up (3). Male Masters Team. Champions (3) and Runners Up (3). Male Open. First, Second and Third. Female Open. First, Second and Third. Male Masters (over 40). First, Second and Third. Female Masters (over 35). Winner. Male Masters (over 40). Winner. Male Senior Masters (over 45). Winner. Major Unit. Champions (4) and Runners Up (4). Minor Unit. Champions (3) and Runners Up (3). Male Open Team. Champions (4). Female Open Team. Champions (4). The entry fee is £16 per entrant this includes a £1 online admin fee. There is a dedicated link above . If you are entering from DII you will need to cut the link in the footnote into Google Chrome. Use of the online system is strongly encouraged, however last minute changes are inevitable and therefore entries on the day will be accepted. The entry fee covers the cost of the event, individual and team prizes. Online registration has been designed to be simple and secure – each entry has to be done individually so that timing chip numbers can be allocated. The online process has been streamlined but due to the huge amount of changes in unit names etc some may not be listed. If your unit or cap badge is not listed in the drop down list you are to email lee.rickard432@mod.uk or add a comment to the Army Triathlon Association (Members) Facebook page. Once the unit has been created you will be emailed / replied to on Facebook. On the day entry. Cheques are to be made to Army Triathlon Association the fee will be £20 per entrant. On the day entry close at 1100 hours. Inter-Services Team Managers. The Inter-Services will all be registered on the day by the Team Managers and paid for by cheque at £16 per athlete. Please ensure that team sheets and payment is made promptly. Once the team sheet is submitted athletes details will be placed onto the DB Max timing system and you will be issued chips corresponding to your athletes as per the team sheet. Para-triathletes. The event will be open to all members of the Tri-Service community and the course will be adapted as necessary to ensure that all para-triathletes can race. Registration. All competitors will need to register in the DB Max gazebo 0930 – 1100 hours in order to receive timing chips. Rules. The race will be run in accordance with BTF rules. Bikes are to be in a road worthy condition and approved (ANSI / SNELL) cycle helmets must be worn for the entire cycle section. Draft busters will be in operation on the course and competitors will be penalised / disqualified in accordance with BTF guidelines. Results. The electronic timing system will be used to ensure accurate and timely results. All race details and results will appear on the DB Max events website and the ATA MOSS page, hard copies will NOT be available on race day, however, there will be individual timing print outs available. Travel. All travel costs for this event are to be met by competing units using their own Budget and UIN. 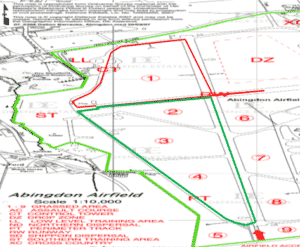 The postcode for Abiningdon Station Airfield, ABINGDON, Oxfordshire, OX13 6JB – please do not enter Dalton Barracks. Follow the signs to the transition and registration and note there will be limited supplies of water, shelter and changing facilities. Duty Status. Commanding Officers are to authorise ‘on duty’ status prior to names being released on Orders. Officers and soldiers participating in this event must have their names detailed on Part One Orders prior to competing. Safe System of Training (SST). The event is conducted within the parameters of the SST. Risk Assessment. The Risk Assessment for the event has been conducted by DB Max. All competitors are Medically Fit to Deploy. All competitors are fully hydrated throughout the day. All competitors must have passed the Military Swim Test and have it recorded on JPA. All competitors must swim in a wetsuit. All competitors must eat throughout the day to maintain good energy levels. A warm up / cool down is conducted prior / post event. Ensure that SST are carried out throughout the event. All competitors are ‘on duty’ and names must be placed on Part One Orders prior to the event. Medical Staff. In the event of an injury the procedure to be followed will be directed by event coordinator as detailed in the safety brief prior to the championships. Medical emergencies will be dealt with by the emergency services this will be coordinated by the management team. Reporting. All accidents or near misses during the day are to be reported by the individual to their respective chains of command as soon as is practicable. Units are responsible through the duty holding process and all accident regardless or whereabouts must be recorded by the individual and through the unit process. Questions are to be directed through respective Unit Safety Advisors (USA) in the first instance. Insurance. All athletes are advised to have their own third party liability insurance, accident and legal costs insurance cover. Army Triathlon Association Membership. Army participants do not have to be members of the ATA to race but membership is strongly encouraged. Membership only cost £10 per year; all details including benefits can be obtained from the ATA MOSS page and by speaking to membership secretary on the day. Summary. The Army Triathlon Inter-Unit and Individual Sprint Duathlon Championships 2018 is open to Regular / Reserve service personnel from all three Services and entitled MOD civil service personnel (who must take leave and show proof of third party liability insurance). Further details can be gained from DB Max or through the ATA MOSS page. Please encourage online entry and any queries should be directed to the undersigned in the first instance.